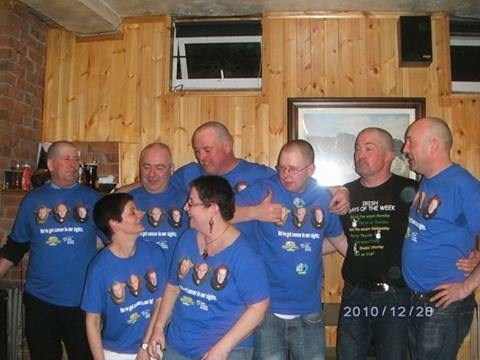 On the 16th March 2014, a local group held a Shave 'R Dye fundraising event in support of the 'Irish Cancer Society'. It began as an idea of Mike Fahey to do something to commerate his father, the late Dinny Fahey, Glenmorgan, Hollyford. His friend, Mel Sheridan, immediately jumped on board and so began the preparations for the night. A few others decided to join them namely John Ryan, Paddy Ryan (Matt), Mick Ryan (Seanog), Helen Sheridan, myself (Mary Fahey) and Steven Shiels. Ger Fahey was a surprise addition on the night and kindly let his hair be sacrificed as well as his infamous beard. Jim & Mary Ryan Rue kindly hosted the event in their pub and provided the entertainment and well needed grub for the night. Entertainment was by the one and only, Willie Bun and, I have to say that, he did a fantastic job getting everyone involved in the shaving, creating lots of extra ways to get money! 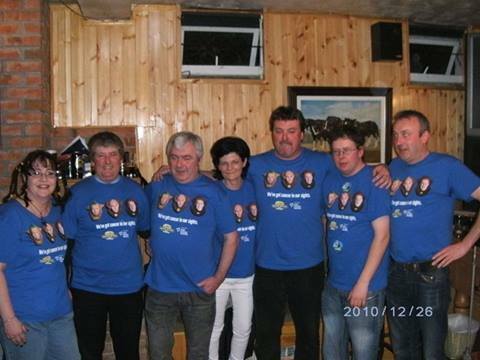 The Shaving was expertly done by local ladies, Martina Heffernan (neé O'Dwyer) and Helen Sheridan (neé Riordan). A big thanks to Paula Light (neé O'Dwyer) for being the accounts person for the night...'twas hard to keep track of everything! Well done to Claire Shiels who did a fabulous dye job on Steven's hair. A fabulous night was had by all! Well Done to everyone involved!